Gettin' a lil' psycho on tyres ! Art Tidesco blogs on all things motoring. The first was it's flathead V8 the first Ford V8 which was originally built in the USA in 1932. This motor in various guises from 136 CUI / 2.2 litre to 337 CUI 5.7 litre was in production until 1973 when German built trucks with a variation of this motor ceased production. This easy to maintain and upgrade motor was popular with hot rodders and racers alike, indeed Allard amongst other special builders also installed a variation this motor in some of its most successful competition models. The second innovative feature of the Fordson 7V was the forward control cab which placed the driver alongside the motor which improved the drivers vision of the road and allowed for greater maneuverability in congested urban environments. This particular feature did not take off until the 1960's Ford having taken a step back placing the driver in the traditional position behind the motor with it's 1950's Trader models. 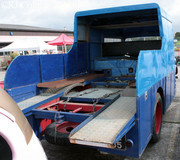 Note the cab also has an unusual for the period one piece windscreen. Fordson 7V's like this particular one were the vehicle of choice for Britain's National Fire Service during the 2nd World War and painted grey they were an all to familiar sight during the Blitz Krieg. The Fordson 7V chassis was also adapted during the 2nd World War to build the armoured flathead V8 powered tracked Loyd Carrier. With the cessation of hostilities and the post war boom in motor racing Fordon 7V's fitted with Flathead V8's were much in demand for use as racing transporters giving many fire tenders a second lease of life. 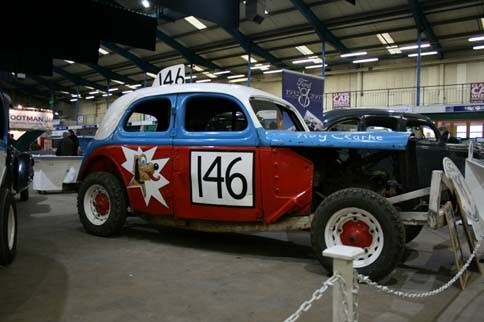 The Clarke family use this 1937 example, seen at the Rare Breeds Show, to transport their collection of replica Stock Cars as raced in the 1950's. Thanks for joining me on today's transporter edition of 'Gettin' a li'l psycho on tyres' I hope you will join me again tomorrow when I'll be looking at British built variations of one of the worlds most popular cars. Don't forget to come back now ! Was one of these Fraser Nash BMW's an antecedent of the AC Cobra ? Follow Psycho on Tyres ! The first race I attended was at Ndola in Zambia where Mum's boss raced a Mini. I was taken to The Race of Champions '73 - '75, and in ‘76 to the last GP on the Nordschliefe. A succession of cheap cars allowed me to head for the Silverstone 6 hour races '78 - '92, Le Mans and the British/European GPs '79 - '83. In ‘85 a buddy Sven phoned up and asked me to crew for his #44 Ray's Toys Capri in the Willhire 24 hours, I spent the weekend lugging jerry cans and holding a fire extinguisher during pit stops. By ‘87 Sven was clocking up wins in the Alfa Sud series 1st in a 33, destroyed at Castle Combe, and later in a Sud . In 1990 I went racing in a 2CV 'LYLLYK' highlighted by the Mondello Park 24 hours. From ‘92 to ‘03 I lost track of racing until blogs on yahoo sports by Jerry Bonkowski, awakened a passion for NASCAR. Thanks to Rowdy.com I went to the April ’09 Arron's 499 making a 7000 mile round trip, quite a contrast from the BTCC at Brands Hatch . All Rights Reserved MMX Ralph Juergen Colmar/Art Tidesco e-mail:- arttidesco@netscape.net. Awesome Inc. theme. Powered by Blogger.